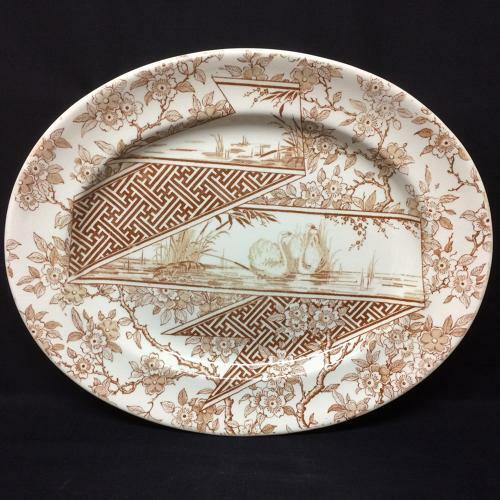 This Victorian 15 1/2 " wide platter is transfer printed in brown. The aesthetic pattern features flowering cherry blossoms completely encasing an asymmetrical Japanesques ribbon tapestry with exotic geometric designs and a scene of a pair of Swans at the water's edge. The piece is marked on the underside with an impressed registration mark and trademark that identifies the maker as Doulton, a pottery maker working in the Staffordshire region of England during the 19th century.